The Rawlings rotor is designed to maximize inertia while minimizing its weight. With the increase of inertia our machine runs at lower RPM’S than our competitors machines and half the speed of conventional hammer mills resulting in overall savings of electricity and maintenance costs. The cam profile of the Rawlings rotor prevent feed surges by keeping material closer to the cutting edge of the bits. This translates to better productivity as the in-feed conveyor is stalled less frequently and less down time as the increased energy reduces the number of motor drive stalls. The Rawlings Super Hi-Inertia Hog provides the crushing and shearing power needed to handle really tough jobs like green waste, cypress, redwood, cedar, black spruce, poplar and a wide range of other stringy and fibrous materials. Extremely tolerant of Contaminants, Rocks, Metal without catastrophic maintenance costs if metal enters the grinding chamber. Hammer hogs run at higher RPMs than that of a solid rotary hog. In general hammer hogs contain a plurality of pivoted hammers on the outer rotor dimension. The hammers pulverize the material against an anvil. The rotor is light and the hammers are heavy. 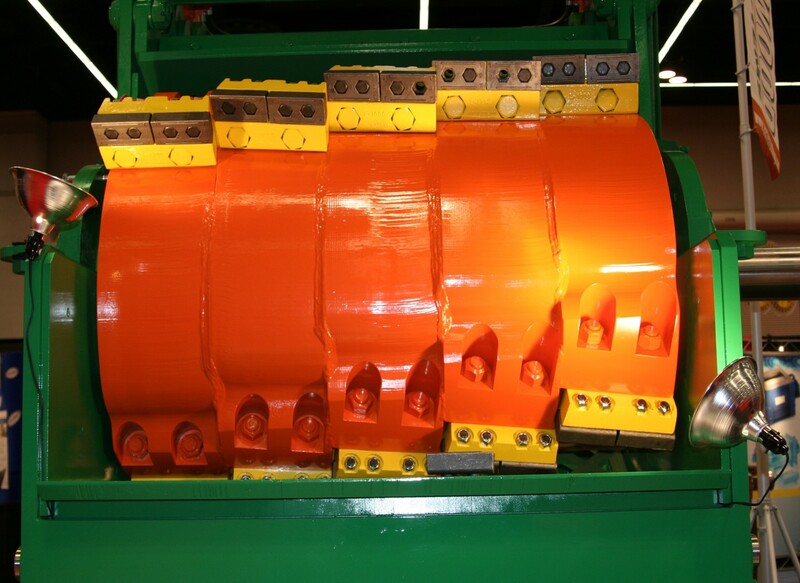 The rotor tends to be difficult to start because the pivoted hammers hang towards the bottom of the machine. Bearing wear is high and maintenance is excessive. The hammer hog is also unsuitable to handle contaminants without extensive catastrophic damage once they enter the grinding chamber.